Perfect Puppies For Picky People, litter born February 2019! Meet Sucha! 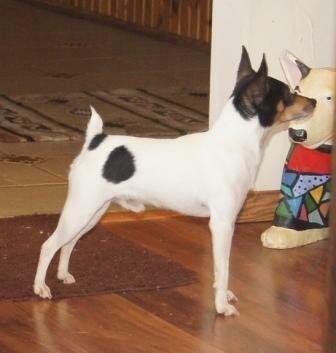 She's an ideal female Toy Fox Terrier, small (6 lbs, 2 oz) but athletic like her Champion dam. Sucha is perfectly complimented by Rolex who is a perfect match for her, structurally and genetically. Both are super-sound and perfectly exemplify the UKC and AKC Breed Standard. and everything we look for in an outstanding TFT. Click for more photos of Sucha Girl O'BJ and see her puppies below! Sucha's mother Champion Sally Jo (5 lbs, 7 oz) was a lucky purchase through a good friend who is a UKC judge. Sally Jo was my little lap (and heart) dog. She passed on her perfectly angulated rear quarters with strong joints and well let down hocks. Sucha's sturdy body and incredible mind are always busy but never doing anything wrong! Sucha passes in high tail set, always up as she excudes confidence and that "look at me" attitude that made her mom such an easy show ring winner. Sucha's sire is Barbary Johnny Cash O'BJ I was soooo fortunate to have been able to acquire Johnny from the undisputed top show breeder, Denise Monette in CA. Johnny gave me perfect size and terrier type in a tuck-in-your-arm package which we've doubled up on in this gene package. Sucha was bred to Rolex Right O'BJ a Barbary Johnny Cash O'BJ son to carry on the size, structure, and soundness. <-- Rolex is a perfect match for her, structurally and genetically. 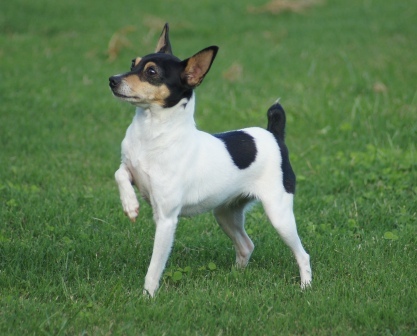 Both are super-sound, great shoulders, strong legs and back which perfectly exemplify the Toy Fox Terrier Breed Standard. With 30 years in Working Dogs, sorry, but even a Toy breed has to be structurally sound! All Toy Fox Terrier puppies are darling but these babies are genetically programmed for health, superior intelligence and soundness. They are tiny terriers bred to entertain their family and uphold the AKC Breed Standard. Over 50 years of breeding top Champions, I couldn't be more proud of these O'BJ babies. 5 week old OneSpot Girl, sweet as can be. 5 week old TwoSpot Girl, the feisty one! They aren't quite sure about standing on the grooming table for the 1st time. And what about that camera??? Look - Don't Look...Snap!